A great option for busy and high-traffic care homes or nurseries, our Gompels Heavy Duty Low Temp Stain Remover is provided in a large 10 litre bottle. Sitting within a durable plastic container with secure screw down lid for storage, this formula can be easily distributed out into smaller bottles for ease of use. 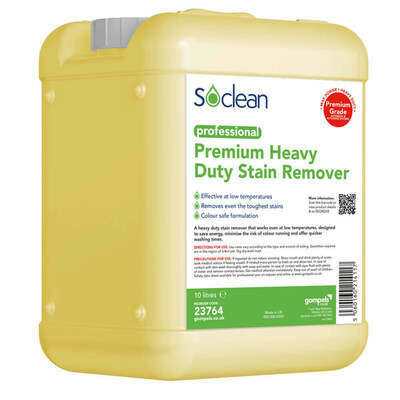 Highly effective, this cleaner is lightly fragranced and colour safe and can be included in your wash loads along with patient clothing, soiled bedding or even sport kits. Working at temperatures as low as 30 degrees, this stain remover allows you to run lower energy bills making it both ecological and economic while still providing a powerful clean to every item. For all your washing needs, we stock everything from Totally Soluable Laundry Sacks on a Roll through to the Addis Laundry Basket 40 litre, and all at exceptional wholesale prices.